Health care is the biggest expenditure in the New Brunswick budget, just as it is in all the other provinces. However beyond that big expense our understanding of where public funds are spent is kind of fuzzy. Are we short-changing municipalities? Do we spend too much on tourism sites? Does private business receive too much support? These are some of the questions being raised on this election campaign. So what’s the answer? To change New Brunswick we need to properly fund the programs and services that will drive that evolution. To determine if we are positioned to do that, we need to look at where and how we spend public money now. #2 – Learning. This includes preschool through to post-secondary education and job training and retraining. Funding for New Brunswick’s chronic illiteracy challenge comes from this pot, as do the operation grants for the province’s four universities and the New Brunswick Community College. #3 – Running Government. Highlights include: General Government, which covers civil service benefits and pension plans; Government Services, which includes Service New Brunswick; and the Legislative Assembly, which covers MLA salaries, Elections New Brunswick and the Auditor-General. To get a complete breakdown, you can look up individual department’s revenue and expenditures in the 2014/15 provincial budget. #4 – Paying Off Our Debt. This fiscal year, New Brunswick paid $685 million towards its $12 billion debt. #5 – Building Communities. Into this category we’ve placed roads, public works, local government, energy efficiency and the environment. #6 – Boosting the Economy. In addition to Economic Development and Invest NB, we’ve placed the departments that oversee the management of our natural resources – fishing, aquaculture, agriculture, forestry and mining. #7 – Law and Order. Pretty self-explanatory: policing, the courts and New Brunswick’s laws. #8 – The Good Life. As I said last week, what’s the point of living in the Maritimes, if it isn’t fun? I’d add to that making sure you and your family stay healthy. Here’s the funding for all the fun and healthy stuff via tourism, culture and preventative health care initiatives. This is where we build New Brunswick pride. So that’s how we spend our public funds now. The bulk – 88 per cent – is spent on four major functions: helping others who are sick or unemployed, learning, running government and paying off our debt. Everything else – building communities, boosting the economy, law and order, preventative health, culture and tourism, is just 12 per cent of spending. Is this a recipe for success? Or do we need to try a different mix? What would you increase? What would you decrease? What are our shared priorities for public money? provincial government revenue comes from New Brunswick taxpayers. According to the Department of Finance’s Pre-election Economic and Fiscal Outlook 2014/15 to 2017/18, New Brunswick receives about 36.4 per cent from the federal government, via the Equalization Program, the Canada Health Transfer and the Canada Social Transfer. In this fiscal year, New Brunswick received a 10 per cent increase over the previous year’s equalization payment, the third highest bump in Canada, behind Nova Scotia (11 per cent) and Quebec (18.5 per cent). PEI received 6 per cent more, while two provinces reduced equalization payments; Manitoba (2 per cent) and Ontario (37 per cent). Newfoundland and Labrador, Saskatchewan, British Columbia and Alberta do not receive equalization payments. 3. Introduce new technologies to deliver services in a cost-effective way. Current and previous New Brunswick governments have tried a combination of these reforms, with a strong emphasis on the first two options. I’m most interested in the third option because it could lower costs and still deliver services, an all-round better result for everyone. However it isn’t likely to be enough, which means the next government will need to try a mix of reforms. Understanding how we earn and spend public money will help voters figure out where to save it – along with the public services they value the most. 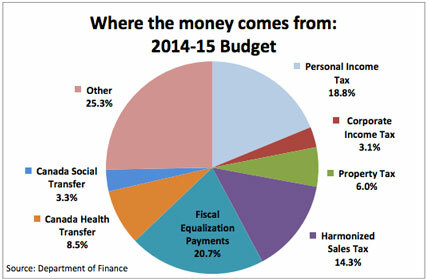 Interesting post, I’ve never seen the budget broken down this cleanly before. 3 of the 4 provinces you reference that do not receive equalization (Alberta, Saskatchewan & NFLD) are also the same ones that are actively making use of their natural resources. I wonder if that’s a coincidence? Of course Mark! Increasing revenue should be the number one priority. And no, it is not a coincidence that the four provinces making use of their natural resources are also the provinces not on equalization. Right now Canada has a resource-based economy. What we think of that and what kind of economy we want to have will be the dominant public policy conversation for the next few years in both New Brunswick and in the rest of the country. I am curious to know how these ratios stack up against other similar provinces…particularly Nova Scotia. Are the ratios roughly the same or are there glowing differences? On the revenue side I think we also need to discuss corporate tax rates. I may be interpreting things incorrectly, but my recollection is that I have been hearing corporate leaders saying that corporate taxes are too low. It seems to me that an adjustment in that area may be past due. I will do some comparisons and get back to you Michael. I would presume the health and welfare would be similar across Canada. I found it interesting to see the percentages – we spend a lot of time debating economic development strategies, the value or public art, how much money is spent at tourism attractions but in the grand scheme of things, all of it combined is so small compared to the two things we have such as difficult time talking about – health care and social welfare. You are right the New Brunswick Business Council has in the past advocated for increasing corporate tax rates. You’re right, the NB Business Council encouraged the gov’t to increase the corporate tax rate last year, as a way to help reduce our deficit and move closer to paying down our debt. And they did! From 10% to 12%. From the lowest in Canada to the middle of the pack. Whether it could or should be increased again is a point of discussion, along with HST increases, personal income taxes and other revenue generators. All the while, we need to get really creative with our spending, and I believe we need to “right size” how we deliver key health and education services. I’d love to know how you’d spend $7 billion to build the New Brunswick you’d like to live in. And Lisa’s right, we need to have a long, hard conversation about what we want from our resources (recreation, revenue, biodiversity, and more!). Love the spending breakdown and the discussion it has generated. Regards resource development, of course it’s no coincidence that the provinces that are doing best are exploiting their natural resources. I have this sneaking suspicion that those who protest initiatives like shale gas exploration would be the very same people who would be first be first to protest when the government is forced to cut back on something they value, like say their local hospital. I assume in many cases this is because of an absolute inability to connect the dots. Easy to protest, especially when you don’t have to concern yourself with the consequences.